My recollection of “Dumbo” is incredibly brief and simple, and may even be a false memory. I believe I watched the 1941 classic when I was four- or five-years-old. I’ve never had an interest in rewatching it even though it is a relatively short animated classic, clocking in at barely over an hour. That’s a lot easier to digest than this Burton-ized remake, which has ballooned to nearly two hours, relies heavily on green screen and CGI, and has removed the talking animals element. 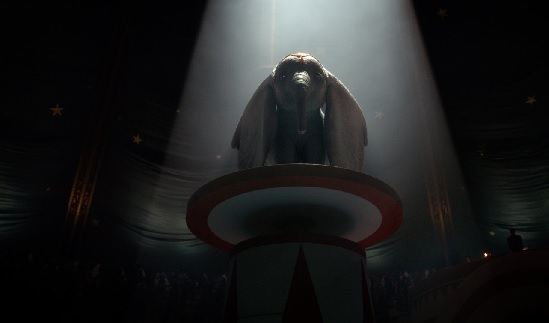 Instead the story of Dumbo is told with the help of the humans around him at the circus. Ringmaster Max Medici (DeVito) has recently purchased a pregnant elephant, believing that a baby animal could draw curious eyes to his traveling circus which has currently set-up shop in Joplin, Missouri. Much to his dismay, the baby elephant is a “freak.” Max believes the oversized ears will draw laughs instead of affectionate, “Awhs,” and he’s not wrong. Believing in the blue-eyed baby elephant though is Milly (Nico Parker) and Joe (Finley Hobbins), the children of Holt (Farrell), a WWI veteran returning home without an appendage and attempting to adjust to his sad new life as a widow. Milly and Joe also know about Dumbo’s talent as a flying animal. There’s actually a lot to like about “Dumbo,” but it fails at doing two vital things, connecting emotionally with the audience and telling a story about acceptance. The components are there, but they never come together. Since the animals can’t talk, we’ll never know what Dumbo is actually thinking, but Burton does an odd thing. He never really shows pain, frustration, or loneliness etched across Dumbo’s face once he’s separated from his mother. Instead he has the human actors state how they think Dumbo is feeling. There are a few moments between Dumbo and his mom, but nothing on the level of the original. As for accepting others for their differences, it feels more like a theme that’s left to simmer on the film’s backburner. Instead of hammering that point home through allegory, the film feels more interesting in introducing ancillary characters and distracting viewers with visual effects. It’s an odd observation because director Tim Burton is known for allowing his weird to overtake his more normal productions, as he fights for the voice of the bullied or marginalized hero. This might be his least weird movie, settling for a cookie cutter style, instead of his usual gothic imagery juxtaposed against mainstream aesthetics. But like I said, there’s a lot to like in this movie. Despite its PG rating, it’s perfectly safe for kids of all ages and there’s nothing really terrifying. The children at my screening appeared to adore it. It may be nearly two hours, but it never feels boring or dull. It never stoops down to an Illumination level of humor and has several legitimate jokes. The green screen is very impressive considering and every adult actor manages to gnaw on that green screen while the child actors are believable most of the time in their roles. I just don’t see children rewatching this over the years and eventually showing it to their kids one day. There’s one interesting part of the movie that I really enjoyed and it even gave me pause as to where or not Disney executives watched the final product. I say this because Burton seems to take a subtle jab at the Disney media conglomerate through the film’s villain, V.A. Vandevere (Keaton). He’s an “entrepreneur” that buys up other unique entities so that he can expand his amusement park empire called Dreamland. He has several rides and attractions that feel very reminiscent of Disneyland/Disney World properties. It’s almost as if Burton isn’t just commenting on Disney’s recent purchases of Marvel, “Star Wars” and Fox, but also their current trajectory of buying popular brands to financially exploit instead of giving a voice to fresh, young animators and filmmakers. Or maybe Burton realized that he’s become Hollywood’s tolken weirdo for oddball franchises (“Alice in Wonderland” and “Miss Peregrine’s Home for Peculiar Children”) and wanted to remark on what’s become of the film industry. The intentional/unintentional metaphor certainly won’t be lost on adults in theaters who’ve spent a pretty penny on Disney’s “reimagining” that falls short of living up to the original. Originality is no longer valued at the Walt Disney Company. The last original movie was under their Pixar brand, the film “Coco.” That was November 22nd, 2017. The next original idea? That isn’t until March 2020, another Pixar film. So in between this two-and-a-half year amount of time, one of the largest companies in the world is going to throw out every sequel and remake they can think of at moviegoing audiences, because that’s all that can guarantee the company billions of dollars. Maybe I shouldn’t be voicing my frustration about that in this review of a children’s film, but I find it necessary for you to be prepared for my and other’s annoyance at the litany of live-action remakes and sequels that continue to pour out of the Disney factory like a river spilling over its banks. Back in 1941, the House of Mouse took a brave attempt at something new and unique. That’s no longer the case.